The Instant Pot DUO80 8 Qt 7-in-1 Multi- Use Programmable Pressure Cooker went on sale during the Black Friday blitz at a $42 discount, and people went completely crazy over it. 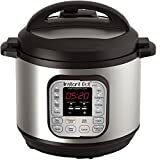 Rightfully so, since this is the biggest and perhaps best multi-use cooker model that Instant Pot makes. So many people were upset that they had missed the crazy deal, but then something magical happened: it went back on sale yesterday with an even deeper discount! We felt compelled to tell you about this crazy deal one last time because it’s somehow still in stock on Thursday morning. This 8-quart model for just $79 is probably the best sale on any Instant Pot model that we’ve ever seen, and we’ll be shocked if it’s still available at this price by mid-day today.